Once in a while I happen upon a shop that takes my breath away. A shop where I could buy one of every items. A shop that inspires me. Hope Ink is such a shop. emily hope is especially fond of creating art around the timeless words of Scripture, which is where she finds unending inspiration. 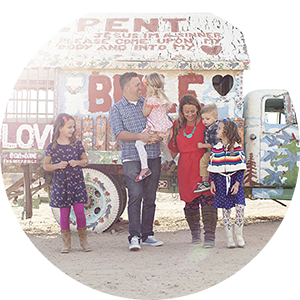 She loves Jesus, her husband, and her four sweet kiddos, and is always wishing for more hours in the day. But is so thankful for the grace that is given each and every moment. I am so encouraged at how Emily is using her gifts to glorify God. Is there anything better to hang on your walls than scripture? Emily is offering one winner their choice of print in either the 8 x 10 or 12 x 12 size. Come back here and tell me your favorite item. 2. Tell me your favorite Bible verse. 3. Follow Emily on Twitter. 4. Become a fan on Facebook. Comments will close at noon Pacific time on Friday August 14th. oh my gosh. i love these prints!!!! one of my favorites is joy. pray. thanks. proverbs 3:5,6 are one of my favorite verses. I love that Psalm 27:4 print, but really I love the whole shop! Thanks for introducing us to such a great site! I love the sweet name and love defined - what a difficult choice! I would love to have either one! Her artwork IS lovely - thank you for introducing us to her. Her heart for God shows through what she has to say at the store. I am torn between 2 the Eph 3:20 quote, because I love to think about the things God has beyond anything I can imagine, and Jer. 29:11 because there was a point in my life when I had to constantly repeat to myself.."I know the plans I have for you, I know the plans I have for you, I know the plans I have for you..."
Thanks again for sharing her work. I really appreciate the "love defined" prints! I also really like Romans 15:13 - we requested it to be read at our daughter's baptism. I actually happened upon Emily's Etsy site when I was searching for prints the other day! LOVE them. 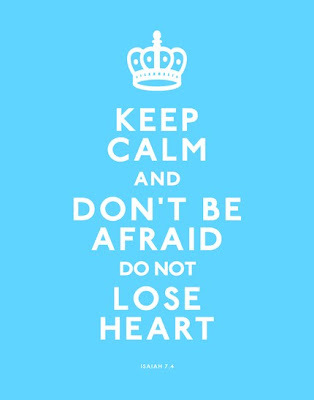 I especially love the "Keep Calm and Don't Be Afraid Do Not Lose Heart" one. I have been thinking about getting the "Keep Calm Carry On" print, but hers is so much better! 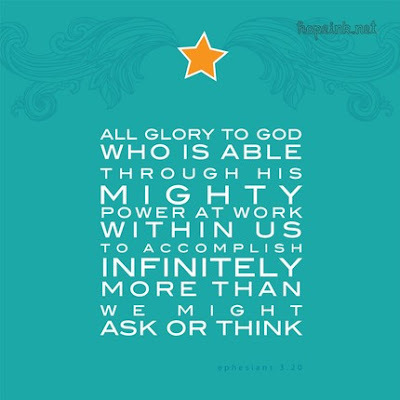 My favorite verse is Philippians 2:13...for it is God who works in you, both to will and to do for His good favor. I am now following hopeink on Twitter! I spent some time browsing Hope Ink a few weeks ago. My favorite at the moment is her "Keep Calm" version. I love the Delight one! Beautiful! Thanks for this opportunity! I became a fan, too! my favorites are love defined and the joy.pray. thanks. i am going to order myself some of her cute notecards! I visited Hope Ink. I love them all! My fav is *Sweet Names*. My favorite bible verse is from Psalms "Be still and know that I am God." The love defined 1 Corinthians 13 took my breath away. So, so gorgeous. I've been looking for a way to incorporate a scripture in our modern/danish decor. She has awesome work! 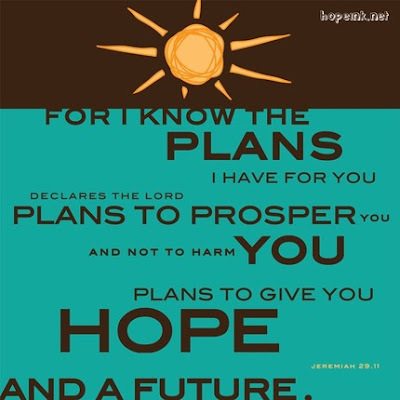 Favorite verse, hands down, is "'For I know the plans for you' declares the Lord, 'Plans to give you a hope and a future.'" Okay so it's not word for word but you know the one. The verse has given me hope more times than I can count. Jeremiah 29:11 is my favorite! They are all awesome! It's hard to pick a fav but the Sweet Names psalm 139 is a good one! the "every word" matthew green would be perfect in my kitchen!!! Favorite? How do I choose?? I would have to go with the home proverbs one. I love proverbs. My favorite is love defined. sweet names is my fave. Though the fig tree should not blossom, nor fruit be on the vines, the produce of the olive fail and fields yield no food, the flock be cut off from the fold and there be no herd in the stalls, yet I will rejoice in the Lord; I will take joy in the God of my salvation. God, the Lord, is my strength; he makes my feet like the deer's; he makes me tread on my high places. Just visited her site...I had discovered it a few days ago searching for decor for my daughter's room. I like the "sweet names." I love her shop. My favorite is the love defined. I love the love defined print. LOVE the "infinitely more" print. Fabulous. Proverbs 3:5&6 definitely rank high on my favorite verses list. When I saw the House of Wisdom I just had to enter. Those are the verses we are "building" our homeschooling on. Thank you so much for sharing these prints with us - what a blessed talent! I don't twitter, but I became a fan on FB. My favorite item is One Thing Psalm print. My fav item from her shop is prob the names. I love everything tho. My favorite verse is 1 Corinthians 8:6 - For there is but one God, the Father, from whom all things came and for whom we live. 1.I LOVE the "Forever" print and would definitely chose that if I won! 3.I am following on Twitter! 4.I am a fan on Facebook! I love the picture with the fence and grass, but think the "man does not live on bread alone" one is my favorite. Great stuff! I am in LOVE!!! Too hard to pick a favorite... but since I have to... 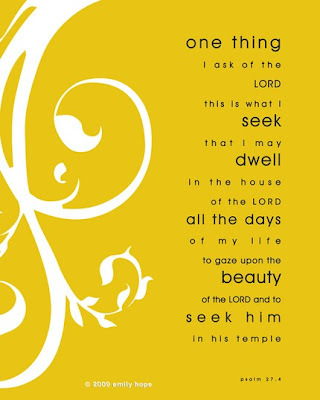 I LOVE the One Thing print with Psalm 27:4! My favorite bible verse is Mattew 25:40 -- The King will reply, "I tell you the truth, whatever you did for one of the least of these brothers of mine, you did for me"
I am now following hopeink on twitter!!! I really like Joy. Pray. Thanks. I Thes. 5:16-18. My favorite verse is Deuteronomy 31:8. "The Lord himself goes before you and will go with you. He will never leave you nor forsake you. Do not be afraid; do not be discouraged." I adore joy. pray. thanks. It is sooo cute. my favorite bible verse is James 1:2 "Consider it pure joy, my brothers, whenever you face trials of any kind..."
I LOVE the love defined personalized prints. This would be a perfect gift for my brother and soon to be sister-in-love for their wedding! I really like her work as well, and there are very few things that I don't like so a favorite is hard! Joy.Pray.Thanks and the loved defined are great, but I think my favorite is Future.Hope, because now that I can see through the haze, I have come to find solace in that verse. One Bible verse I love is James 1:27..."Religion that God our Father accepts as pure and faultless is this: to look after the widows and orphans in their distress and to keep oneself from being polluted by the world." I've joined twitter bandwagon and Emily is the first one I am following! Now I just have to figure it all out! 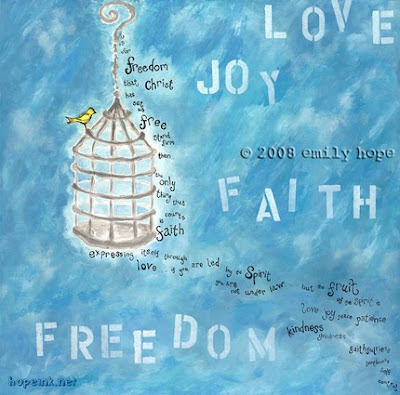 I like...the Jer 29:11 print and the house defined and the true+love....her site is great! I'm thinking about getting my husband the 1 Cor. 13 one with our names for our anniversary! Oh Wow Julie this a great giveaway! I really want the "Love defined" one with me and my husbands names. It is a totally true statement about love, espcially ours. Pick me!! I love the One thing Psalm! The verse is so great and I love the yellow! What awesome prints! My favorite scripture is out of the King James version. Proverb 31:10 "Who can find a virtuous women? For her price is far above rubies"
My favorite Bible verse is Psalm 73:28! "But as for me, it is good to be near God. I have made the Sovereign LORD my refuge; I will tell of all your deeds." My favorite print is the one of 1 Thessalonians. What a neat site! Favorite verse is Romans 11:33-36. Such a wonderful giveaway! These prints are amazing and beutiful! 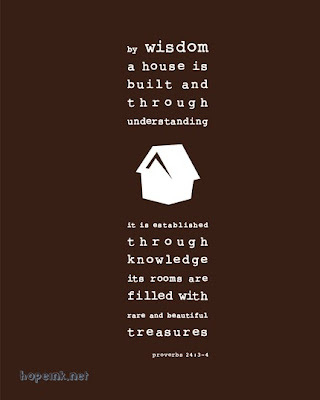 I love the house of wisdom print. Love this stuff!! My favorite is the Be Joyful Pray Give Thanks sign. I also love the ones that have psalm 139 with a name. 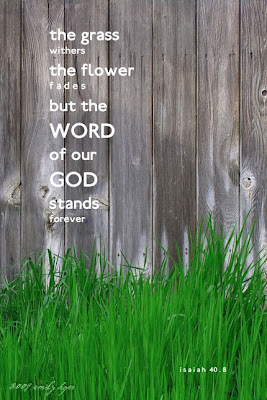 I don't have just one favorite bible verse, because different verses mean more to me at different times in my life. Right now, I'm loving Ps 23:1. The Lord is my shepherd, I shall not want. Before visiting her site I loved the Infinitely More print. That's a special verse for our family. But after going to Etsy I feel in love with the Sweet Names print. That's going on my wishlist now! oh my gosh. am i allowed to love all of them?! if i had to pick, i'd chose "sweet names" so that I could get it personalized for my new niece Cadence, due in October. Thanks for the great giveaway! I don't twitter, but I "hearted" her on Etsy! My favorite verse is 1 Timothy 4:12. Ephesians 3:20-21 is my favorite verse. Her work is beautiful! My favorite is the Love Defined print. Such beautiful words. Just a few days ago I added lots of her prints to my favorites on Etsy!! I love the Keep Calm and don ot lose heart! I want! My favorite is sweet names . psalm 139... I love those verses! Be ye kind one to another, tender-hearted, forgiving each other, just as God in Christ also has forgiven you. I try to tell my daughters the BYKOTA part every day, it's just a simple little mantra I think we can all use on a regular basis! the best, but they are all inspirational. I love the Love Defined w/ the names in the middle! My favorite verse is 1 Cor 13. I love the Jeremiah 29:11 verse...it has gotten me through a lot of difficult and AMAZING moments! Oh, wow! I have to say my favorite is the take on the WW2...stay strong...what a great idea! I love the Infinitely More Print! Well, my fave verse is definitely 1 Corinthians 13: 4- 13, but the one that helps me survive my days is Philippians 4:13, "I can do everything through Him who give me strength." I have two crazy toddlers and this reminds me that I can make it through even the toughest times with them. How do I pick just one favorite?!? Um I think the joy.pray.love would be on the top of my list. But I like the first one you have posted too. Too many great choices! I have been crucified with Christ and I no longer live but Christ lives in me. The life I live in the body, I live by faith in the Son of God, who loved me and gave himself for me. I love the Love defined and th joy. pray thanks. What an amazing shop! My all time favorite verse which humbles me is John 3:16. In my first Bible my grandma crossed out the "world" and put my name in there. Makes me a little weepy! "Stir up the Gift" would be an amazing gift for my artist SIL. Prov. 3:5-6 has been one that I've hung on to to get my thru scrapes in high school and beyond. Isaiah 26:3-4 has become a fast favorite recently thru hard times. Just blogged about her wonderful things! I'm a fan on face book!! Hands down, the true love one! I love the one with the crown and "do not be afraid" such an inspirational and cool piece for your home. love it! want it! My favorite item from her collection is "joy.pray.thanks" It would be SUPER cute in my baby's room!!! My favorite is "love defined . 1 corinthians 13 . personalized print . 12x12"! Love this in the Aqua backround color! 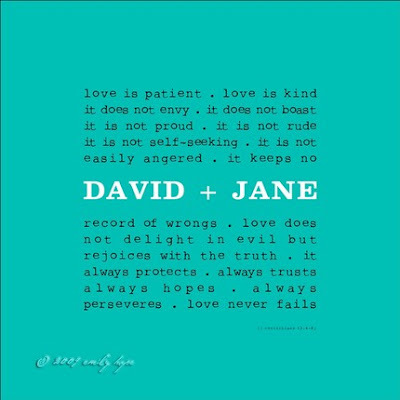 My favorite bible verse is 1st corinthians 13 -- Love is patient! So winning this would be perfect. We plan to have this verse read aloud during our wedding ceremony. and we would love to hang this up in our home someday! WOW!!! I absolutely love her shop. My favorites are the I Corinthians 13 one and the Psalm 139: 1-18 one. My favorite verse is Psalm 139:14. My favorite verse is hebrews 11:1. These are beautiful; I love the Psalm 27 print. My favorite Bible verse is Phil. 1:6. The Lord gave this to me when I was saved, and He is still continuing to do His work in me - God is faithful! My favorite is Sweet Names! Ps. 139 is one of my very favorite passages. Love her stuff! And my favorite verse is Jn 16:33 "I have told you these things so that in me you will have peace. In this world, you will have trouble. But take heart. I have overcome the world!" My favorite verse (right now) is Romans 3:23: For all have sinned and fall short of the glory of God. Blogged about it! Fingers crossed! I love everything! How could I decide on one favorite! I love the house of wisdom, because this will be hanging up in our new house if we win! Delight yourself in the Lord and He will give you all the desires of your heart! the psalms 27:4 is probably my newest favortie thing ever. and the psalm one. and the piece entitled "forever". stunning. beautiful. also my favorite verse ever is genesis one one, it just shows powerful god is... incredible. I love everything she does so picking one is hard. I love the Matt 4:4 for my kitchen, Proverbs 31 for my girls and the Psalms 139 for each of my kids! I have been following her for a while on Twitter! Oh, this a tough one! I love them all! But I really am drawn towards the love defined prints. LOVE Hope Ink! I love Love Defined in turquoise!! I love the entire shop as well. Love defined is my favorate! My favorite verse is "God so loved the world that he gave is only Begotten Son that whosoever believeth in him shall have eternal life." "One Thing" I'm thinking this would be great for my daughter to take with her to her first year of college. Great verse in in her favorite yellow! LOVING One Thing and Sweet Names. i love the 'every word' print. phil 4:19 is one of my favorite verses. My favorite verse is Galatians 2:20. I love House.Wisdom Proverbs. It would be wonderful to put in my new home! They are all amazing! My favorite Bible verse is Romans 5:1-5! I'm following Emily on Twitter.